This is one of Martin’s favorite salads. I think you will really enjoy this very simple and delicious salad. Boil the potatoes. Since they are bite size pieces it does not take long. Don’t over cook. Allow to cool. Place in medium bowl, add the remaining ingredients and mix gently. That’s it. Could it be any easier?! Ciao!! Thanksgiving has come and gone. We had a great time and plenty of food for Thanksgiving dinner. We had a traditional meal. I am sure there are plenty of blogs that will share their Thanksgiving dinner ideas. All I can say is my loving, wonderful family with some special friends were seated at our table. We had a great time, a delicious meal, which we are fortunate to be able to have together. I will always cherish these times. I am so very lucky and grateful to have these wonderful people in my life. Then came Pizza Friday!! I wasn’t sure if I should have our usual Pizza Friday since we just had a huge meal for Thanksgiving. I couldn’t cancel Pizza Friday. Kyle’s friend Paige was here from Kansas for the week. I wanted her to be able to pick a pizza and make it for her visit. It was a quiet Friday since Martin had to work for Black Friday and Rachel was up north with her family for the weekend. We still had a great time. Paige’s choice for a pizza was the Chicken Enchilada Pizza. I also made a garlic pizza (Eric’s request) and sausage pizza (Kyle’s usual). ( Oh, I also made a pizza run to Gamestop in the afternoon for the guys there. 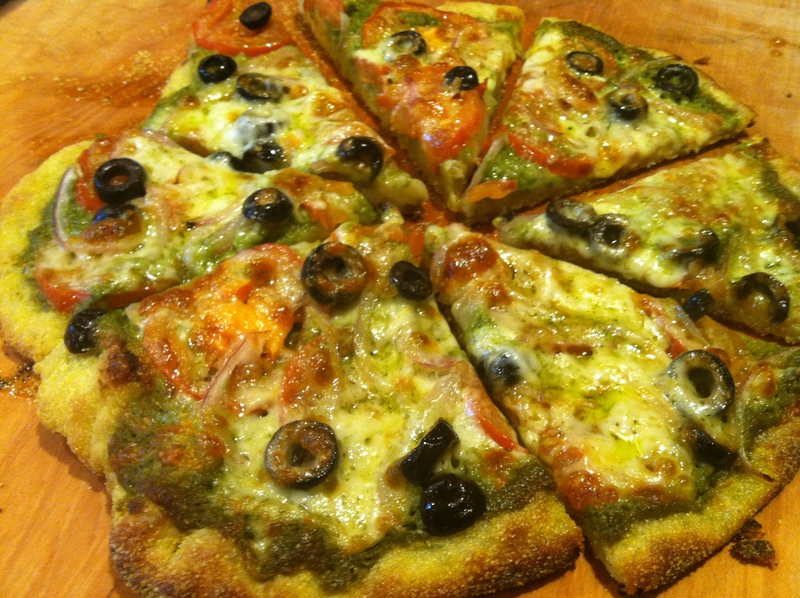 Their requests were a garlic pizza, macaroni and cheese and an italian antipasto meat pizza.) I was a pizza maniac!! Cut the chicken breasts into bite size pieces. Saute the onion in large saute/frying pan 3-5 minutes. Add the chicken, green chilies and taco seasoning. Cook until heated through. Spread the enchilada sauce on the dough, the spread the chicken mixture, add some mozzarella and top with the cheddar cheese. Bake at 500 degrees for 10-15 minutes. It was really SIMPLE and DEEEELICIOUS!! Hasta la vista, baby!! Rachel and Eric found this Mac and Cheese recipe they wanted me to try this weekend. I changed it up a little and below is my recipe. All of us enjoyed this very, very, “Simple and Delicious” lunch. It also took very little time to prepare. Hope you enjoy! Preheat oven to 350. Use 2 Tablespoons of the butter to grease the 13×9 baking dish. In a medium bowl, whisk together the half and half, 2 large eggs and sour cream. Boil noodles according to the package directions. Drain noodles and return to pot. 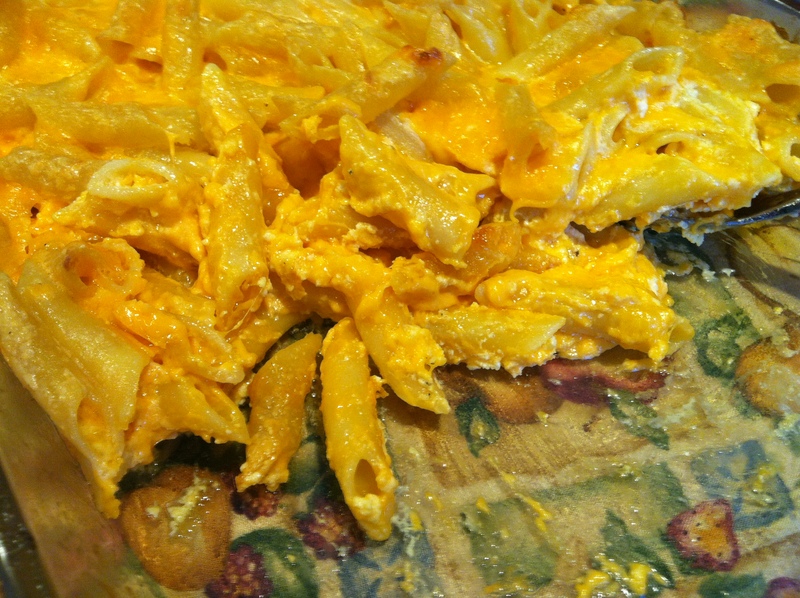 Add the cheddar cheese, cream cheese and rest of butter to hot macaroni and stir well. Then lightly blend in the mixture of half & half, eggs and sour cream. Place into the baking dish. Bake, uncovered, for 30 to 45 minutes or until golden brown and bubbling. (30 minutes was enough for my oven). If you can wait let stand for 10 minutes before serving. I really enjoy making my own dressing. Could this be any easier? 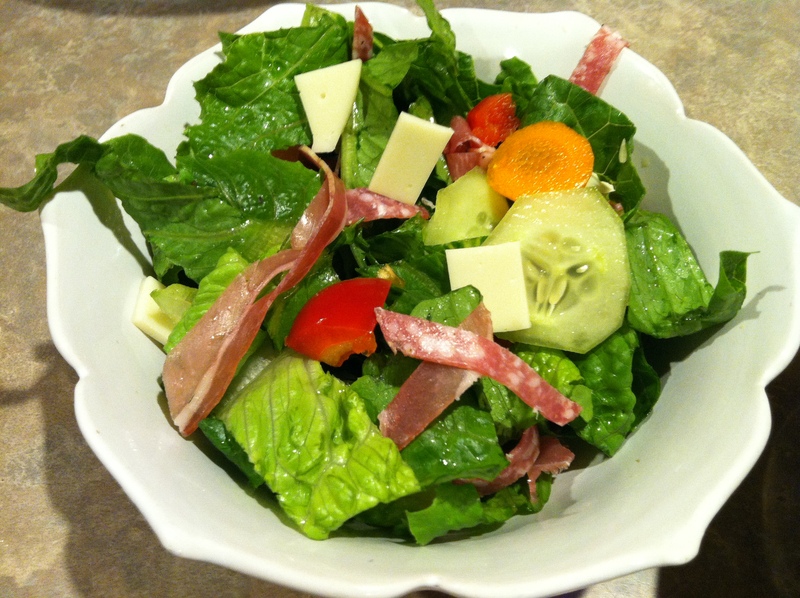 Very simple salad; chopped romaine lettuce, cucumber, carrot, red pepper, antipasto meats (Italian salami, prosciutto & coppa), provolone cheese and whatever dressing you would like. This salad was served with the Asparagus and Roasted Red Pepper Soup! 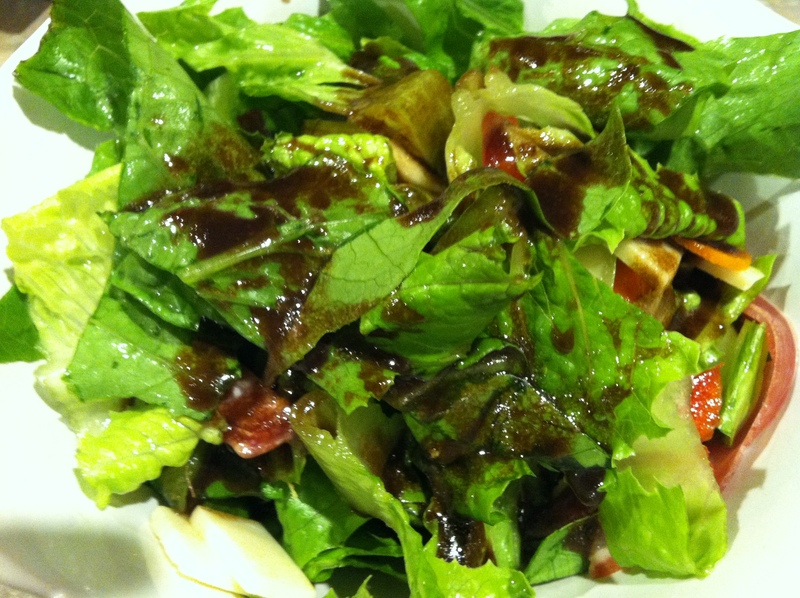 Kent used the Raspberry Vinaigrette and I used the Espresso Balsamic Vinaigrette. In a small container with a tight fitting lit, combine above ingredients. Shake well. That is it! I was out and found an herbal infused olive oil and Espresso balsamic vinegar. I picked them up and decided to make a dressing. Since the balsamic vinegar was purchased from a store that specialized in oil/balsamic vinegars it was somewhat syrupy. No need to add sugar to a heavier bodied balsamic vinegar. You will know because it pours out of the bottle like a light syrup. Mix as above. Store your dressings in the refrigerator. Now, this is “Simple and Delicious”! I woke up this morning trying to think of what I could spend time cooking in the kitchen this weekend. I wanted to make a soup. 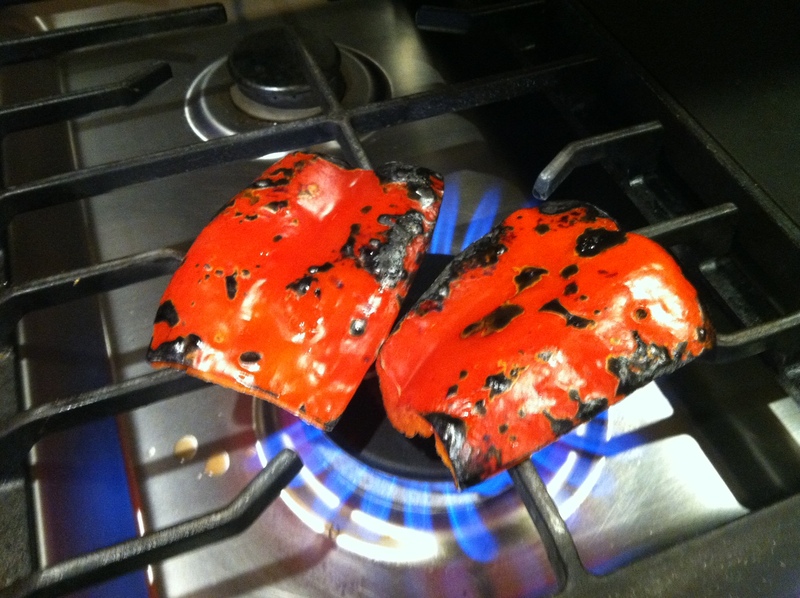 I love asparagus and roasted red peppers. I thought that sounded like a great combo for a mild fall day. When I went online to check this out I found quite a few recipes. I ended up at The Pen and The Pear blog and this is the recipe I used. I may have done things a little different but it was tasty just the same. It was not a difficult recipe at all, just a bit time consuming. I served it with an Antipasto Meat Salad (meats leftover from Pizza Friday) and it was quite a “simple and delicious” dinner. 1 1/2 pounds of asparagus, cleaned and cut into 2 inch strips. Set the tips aside to roast. Y0u will be using the stems in the soup. 1. You are going to want to roast the asparagus tips and the red pepper. This is very simple to do. For the asparagus all you do is put the asparagus tips on a cookie sheet (I used my pizza stone). I put about a Tablespoon of olive oil over the asparagus tips in a bowl and lightly mixed with my hands. I then placed on the pizza stone and in the oven. Roast for 15 minutes. I checked half way through cooking time and flipped over with a spatula. 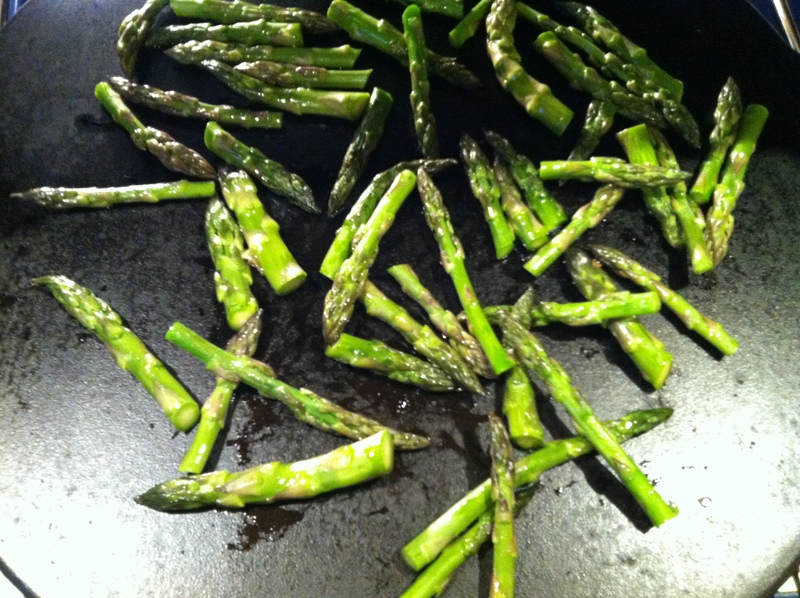 Roasting (really brings out the flavor), grilling, steaming asparagus – I love it any way! 3. 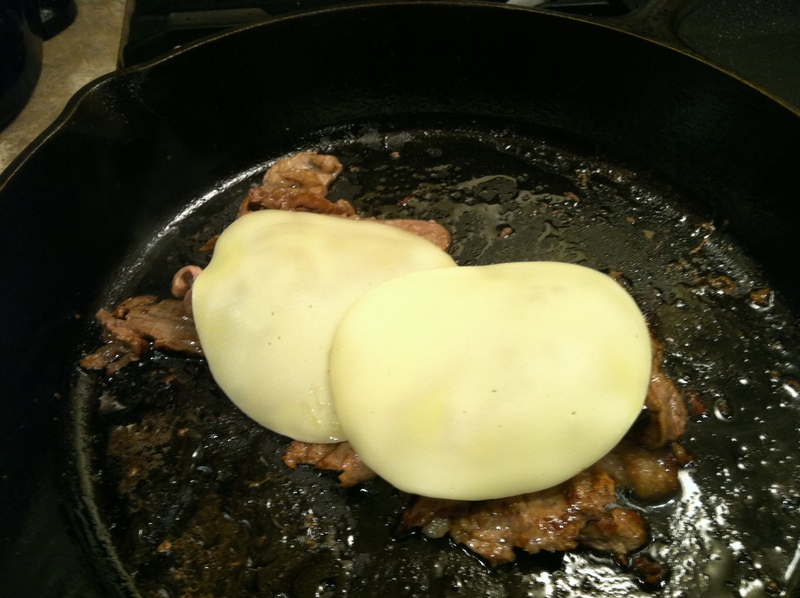 Melt butter and saute the shallot (or onion) and garlic until tender over medium heat. This does not take long at all. You don’t want to burn and have to start all over. Add the 2 Tablespoons of flour and mix together. 4. Add 2 cans of chicken broth to the flour/garlic/shallot. Stir until bubbly and then turn down to simmer. Add the stems (not the tips) and simmer for 20 minutes. 5. After simmering take out the stems. (Yes, take out the stems. They taste delicious so have some while you are waiting for the soup to finish cooking.) The stems were in the soup to flavor it while simmering and it is well worth it. After you remove the stems, add the asparagus tips and roasted red peppers. 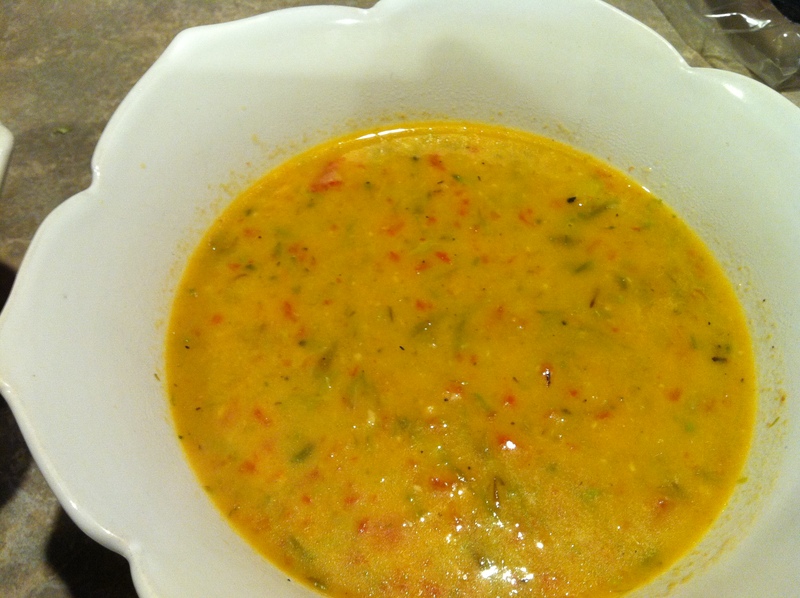 If you have an immersion blender (which I do) you will want to blend the asparagus and peppers. If you don’t have one then before adding the tips chop into smaller pieces. That will work just fine. 6. Add the heavy cream, salt and pepper to taste. Simmer for 10 minutes and serve. Kent and I really enjoyed it with our salad. I was typing this up and said to Kent, this recipe is a little more labor intensive that I thought. His recommendation; if you are in a hurry open a can of soup. Otherwise, this was a simple and delicious soup! 😉 PHEW!! Pizza Friday went well. Lots of political talk going on. It was election week after all. 😉 We had our usual pizzas on Friday with some ribs. Everything was delish!! I made a fruit pizza along with parfait. Fruit pizza sure goes in this house. I don’t think I have to tell you we had a fun time. We always do. Pizza, beer and dessert, what else do you need on a Friday evening?! As always on the weekend I spend some time in the kitchen. Usually too much time. I love to avoid housework that is for sure! 😉 I looked in my fridge and saw some pesto I had made the other day. 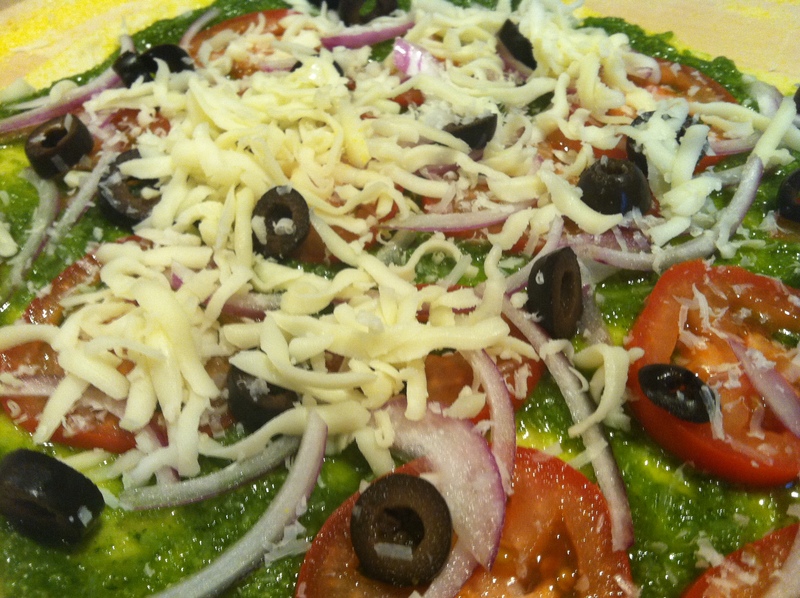 I decided to make a Pesto Pizza. This was super simple and incredibly delicious! This was so easy. 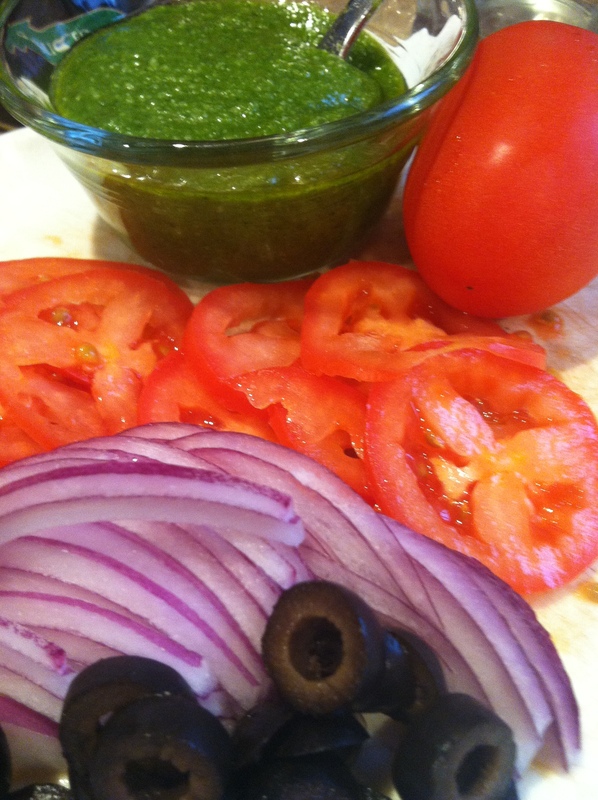 I started with the pesto, topped with tomatoes, red onion, olives, Parmesan cheese (not too much), then last but not least the Mozzarella cheese. Bake at 500 degrees for 10-14 minutes. This will be made again and again. Give it a try. I think you will find it simple and delicious! 4 – sub or club rolls. 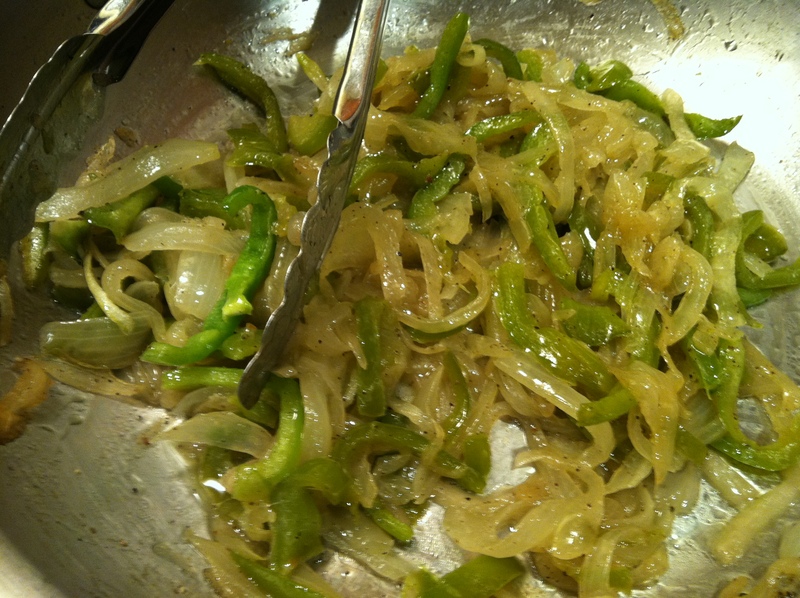 When the peppers and onions are close to being done get out your cast iron skillet. Add 2 Tablespoons of canola oil to the skillet medium high heat. 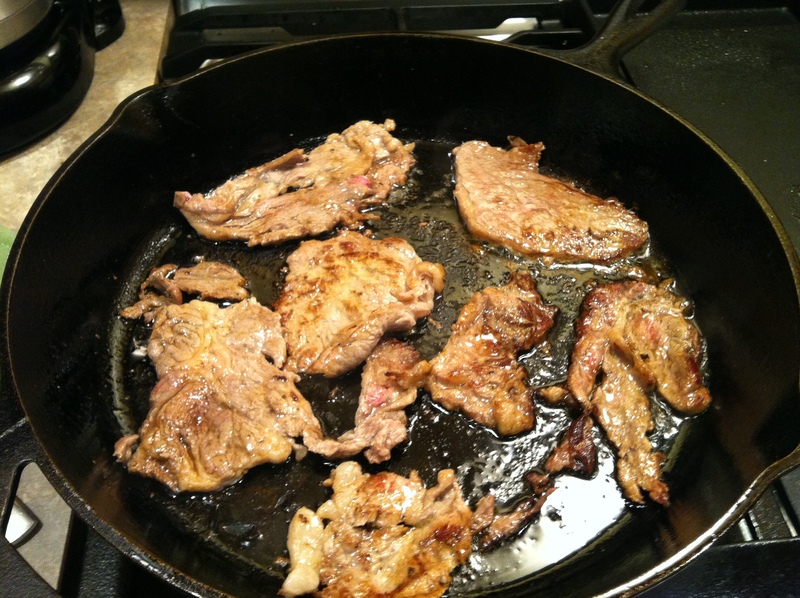 Add 5 ounces of shaved ribeye to the skillet. (I used 6-7 ounces and Kent thought that was great. Kyle, Eric and Martin thought a little less meat next time so I chose 5 ounces for you). The steak doesn’t take long to fry, 5 minutes if that. After it is done move the meat together and top with your cheese choice. Put a lid on the skillet so the cheese will melt. Hollow out one side of the roll. When the cheese has melted put the steak/cheese in the hollowed out side of roll. 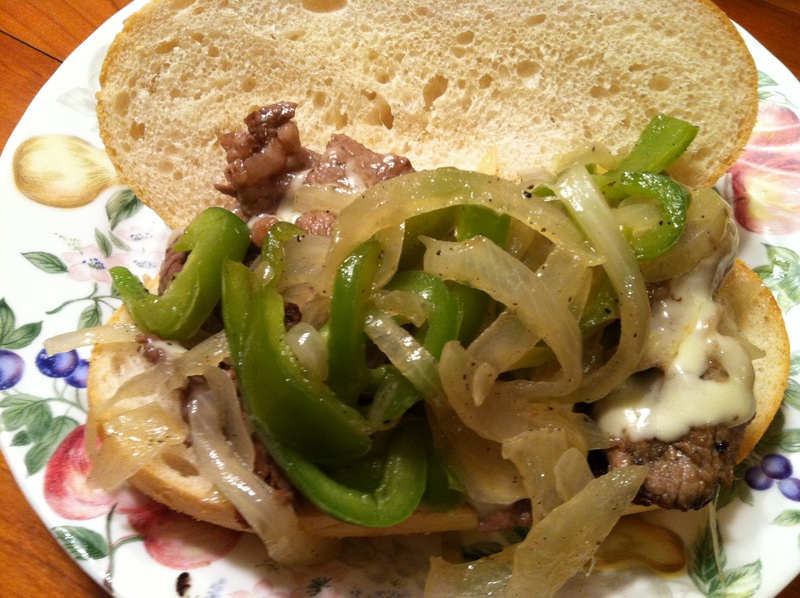 Top with onions and peppers. We don’t use any other condiments. If you want you could put ketchup or marinara sauce on your sandwich too! 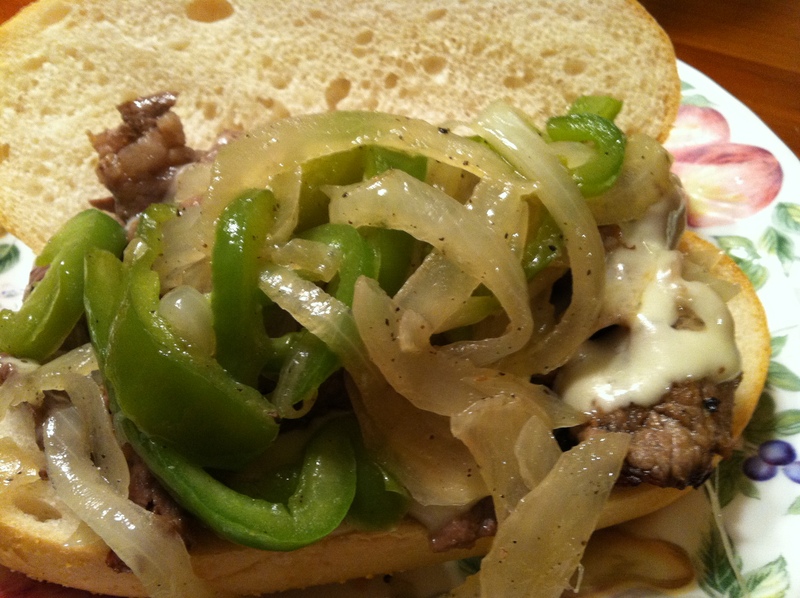 Everyone enjoyed their Philly Cheese Steak Sandwich. Hope you do too! !